We have an event page on FaceBook. We also have a Facebook page for Students Against the Death Penalty. Students Against the Death Penalty also has a website. 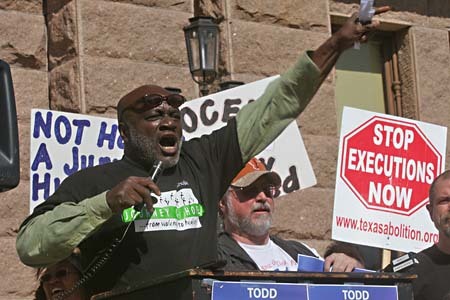 You can also visit the main website of Texas Students Against the Death Penalty, and the websites of two of our main partners, Texas Moratorium Network, which started this alternative spring break back in 2004 and the Austin chapter of Campaign to End the Death Penalty. Murder Victims' Families for Human Rights (MVFHR) and Journey of Hope ... from Violence to Healing have been two of our strongest supporters and sponsors for several years. Another of our most helpful longtime sponsors is Campus Progress. Witnesss to Innocence became a co-sponsor in 2010. Read more about the death penalty at the Death Penalty Information Center. You might also be interested in visiting the websites of other projects we are involved with, SharonKiller.com, www.camerontoddwillingham.com and www.marchforabolition.org. 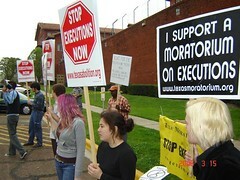 Thank you to everyone who participated in the 2011 Anti-Death Penalty Alternative Spring Break, including the students who traveled from across Texas and other states, as well as from overseas, the death row exonerees who shared their stories all week with us, and the fantastic group of workshop presenters and speakers. The dates for this year's alternative spring break were March 14-18, 2011.Now is an important time in the fight to end the death penalty. After 11 years of a moratorium, Illinois may soon abolish the death penalty if the governor signs the abolition bill he has been sent. Attend our alternative spring break and help us end the death penalty in Texas - the number one execution state in the United States. We are excited about the 2011 program, which includes attending the World Premiere at the SXSW Film Festival of a new documentary about the Todd Willingham case, plus great panelists including several people exonerated from death row, including Anthony Graves who was released in October 2010 after 18 years on death row in Texas. The four death row exonerees who attended as specal guests spent many years on death row for crimes they did not commit: Clarence Brandley, Shujaa Graham, Ron Keine and Albert Burrell. Also speaking was Sam Millsap, a former elected District Attorny in Texas who now opposes the death penalty because he believes an executed person named Ruben Cantu whom he prosecuted may have been innocent. Judge Charlie Baird, formerly a judge on the Court of Criminal Appeals, Texas' highest criminal appeals court,also spoke. Special guests in 2010 were six innocent death row exoneress: Shujaa Graham, Curtis McCarty, Ron Keine, Derrick Jamison, Perry Cobb and Juan Melendez. They are attending alternative spring break to speak with participants about how innocent people can end up on death row. Altogether, the six exonerees who attended the alternative spring break spent a total of about 65 years on death row for crimes they did not commit. It's free, except for a $25 housing fee for those who need us to arrange housing for you. We will house you in a shared room with other spring breakers in either a hotel or dorm. You are responsible for your travel, food and other expenses, but the program and most of the housing costs are on us. The $25 housing fee is all you pay. Register here. Pictured are Shujaa Graham, Ron Keine and Curtis McCarty, three innocent people exonerated and released from death row. They are coming to the alternative spring break. Are you? Recipient of the 2007 Campus Progress Award for "Action Campaign of the Year"
Featured on MTV"s TRL and "The Amazing Break"
Adrienne Rachel and Morgan Lamandre from LSU at the 2007 Alternative Spring Break. They were featured on MTV's TRL about that year's spring break. Our Alternative Spring Break was featured on MTV's TRL and "The Amazing Break" in 2007 . If the embedded video does not play, click the link above to watch it on MTV.com. Click play, then wait 17 seconds and the video will start. This video contains footage of the trip to Huntsville to protest an execution, including the students outside the prison and a clip of former death row chaplain Carroll Pickett speaking to the students. Below is a video of the Peoples' Tribunal Against the Death Penalty organized by participants in the 2008 Alternative Spring Break. This is part one of four. The other parts can be found on YouTube. Below is a video of the 2005 Alternative Spring Break. It was produced and directed by Sarah Garrahan, who attended spring break that year. "I attended the TMN sponsored spring break as a junior in high school in2005. I had just found out about it via the internet/website and followup with a call. The person who answered the call was Scott Cobb. He arranged for me to ride along with another person to Austin. The SB was sponsored and coordinated very professionally—we stayed in UT dorms with a well-planned daily agenda. Everything I know about lobbying someone for a cause, press releases, media coverage, recruiting people to join a cause—I learned within the intense week. It also gave me a fantastic opportunity to participate in the Texas legislative/politicalprocess, an experience I would never have had. I also became familiar with an amazing group of people, who were willing to work so passionately for a cause they believed in. Currently, I am taking a year away from my undergraduate studies to pursue a development, sustainable energy and social empowerment project in Pakistan as a Clinton Fellow. In management of my projects, I draw upon similar ideas and practices I learned from the spring break event. I have never had a second opportunity to participate in such an amazing spring break event since—I will keep this on my agenda for 2011 spring, however!" Ambreen Rahman, who attended the 2005 alternative spring break as a high school junior. She is now a student at Columbia University in New York City, but is taking a yearoff from school to volunteer to bring solar energy lights to women in rural Pakistan. She was a Clinton Global Initiative University Fellow for 2008 and 2009. "I wanted to do something more meaningful during my Spring Break. I figured this would be the place where I could do that." "We all had a simple understanding of the problems with the death penalty and after coming here, we've learned so much in detail about what goes on with capital punishment," Martellaro said. "It's just been so educational, because we all are in agreement that it is wrong and there are problems with the system, and this has been so specific, with so much information, that it really strengthened my beliefs." "Students and youth have played a critical role in every major struggle for civil and human rights in this nation. Ending the abomination of capital punishment is the calling of this generation. Just as before, student activists will likely determine the future of this issue. You must be part of the debate and the action." "Participants will have plenty of free time to meet new friends, see the sights of Austin, and take in a couple of SXSW events if they want to. At the same time they're having fun, they're doing something positive by taking action on one of the major human rights issues of our time"
Video of Rep Harold Dutton Speaking at Rally at Capitol on the "Day of Innocence"